One of the joys of a house in the country is the wildlife that occasionally make an appearance. Bats are common visitors as they roost under the eaves of the house and behind doors. I haven’t quite worked out what species of bat visit us but suspect that they are the common Pipistrelle bat. Not claiming to be an expert on bat identification, I am open to correction on this point! Recently a mother bat appeared on the terrasse with two babies clinging to her. She prepared for take-off and made a valiant attempt to launch herself into the air with the babies clinging for dear life to her torso. Alas, the weight of the babies dragged the bat down and she quickly crashed to ground with all the elegance of an early human aviator in a delicate but unflyable machine. There was nothing for it but to climb up the wall to reach the safety of her roost in the eaves under the house with the two babies grimly holding on. Soon afterwards she reached the safety of the shady eaves and we lost sight of the small family as they retreated under a tile. Bat fans advise that you don’t disturb bats as they go about their day-to-day activities. Taking some photos hopefully didn’t disturb them too much (I can’t claim credit for the photos as they were taken by my daughter Ailbhe). The bats don’t seem to have been too bothered as they’re still in residence in different places around the house. 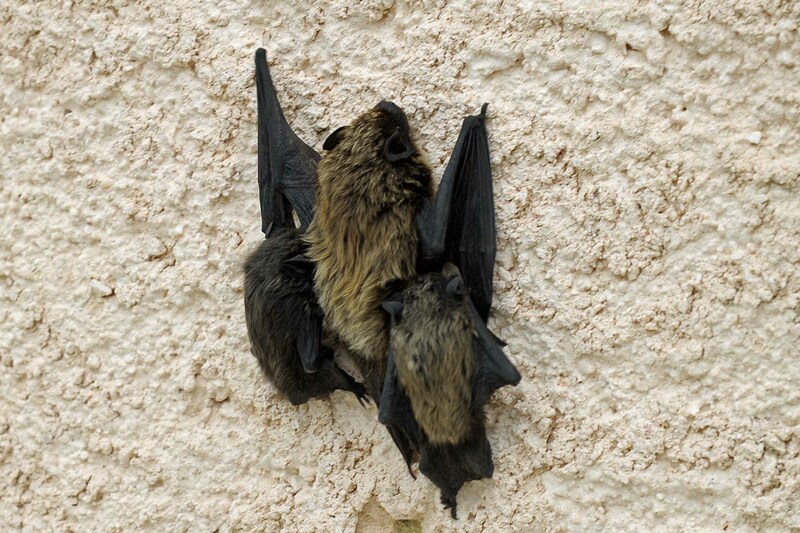 This entry was posted in Travel, Writing and tagged Bats, France, Wildlife. Bookmark the permalink. I found a little guy to looks just like one of those babies hanging inside the umbrella on my deck this afternoon in Colorado. Unfortunately, he wasn’t too happy that we opened the umbrella and I’m not expecting him to return.